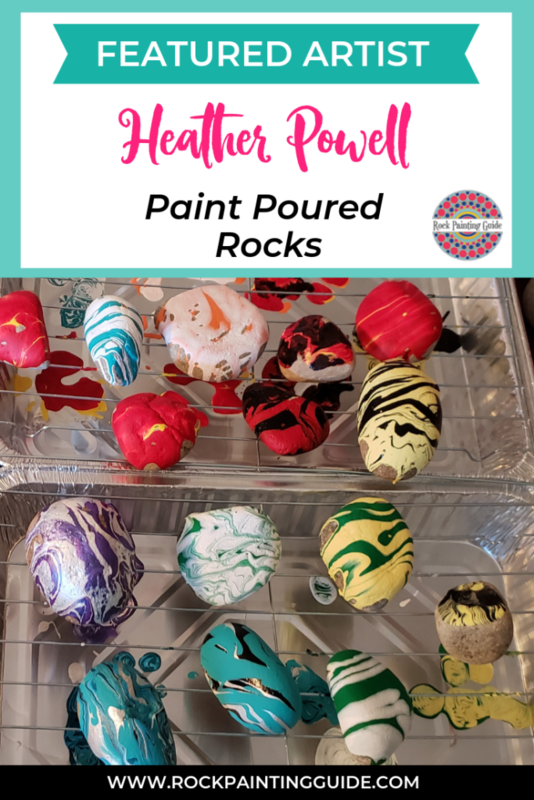 Heather Powell, a west coast rock painter has a passion of spreading kindness in her community with her beautiful paint poured rocks. 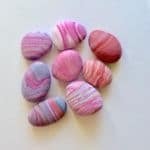 Workman’s Friend Brand shared Heather’s rock painting journey with me and I had to know more about her beautiful rocks. 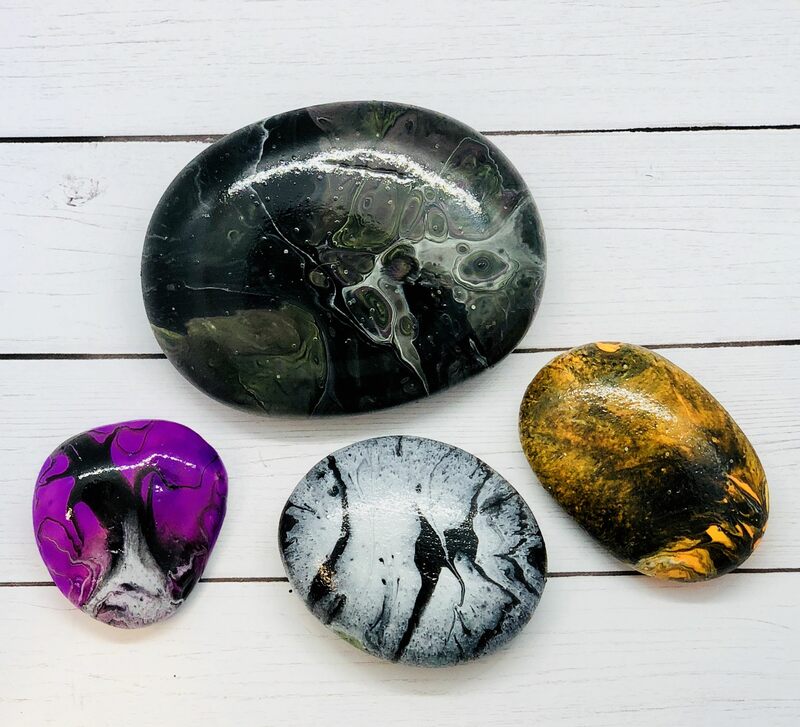 First of all, tell me a little about yourself, and how you got started painting rocks? Walk me through your poured paint rock painting process? What’s your paint pouring process like? 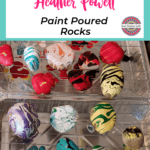 Heather: “I pick out the colors I want to use, and pour some into a Dixie cup, depending on how many rocks I’m pouring that time. Usually about 1/2 full for the small sized cups. I use a paint medium such as Liquitex gloss medium, or you can use water to thin the paints enough to make pouring easier. 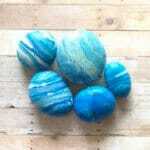 I then pour each color into one larger cup and swirl them together slightly with a stick or plastic knife. then slowly pour them over the rocks either in an up and down motion or back and forth. The paints then start to blend together as they run down the surface of the rocks. So, if you were using pink and blue, you would also get purple as the paint mixed and dried. I do use red white and blue together a lot as they look so stunning together. 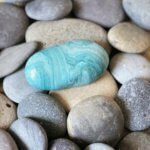 I’ve also used two or three shades of turquoise with a little black and silver, so that the finished rocks look like raw turquoise when they’ve dried. 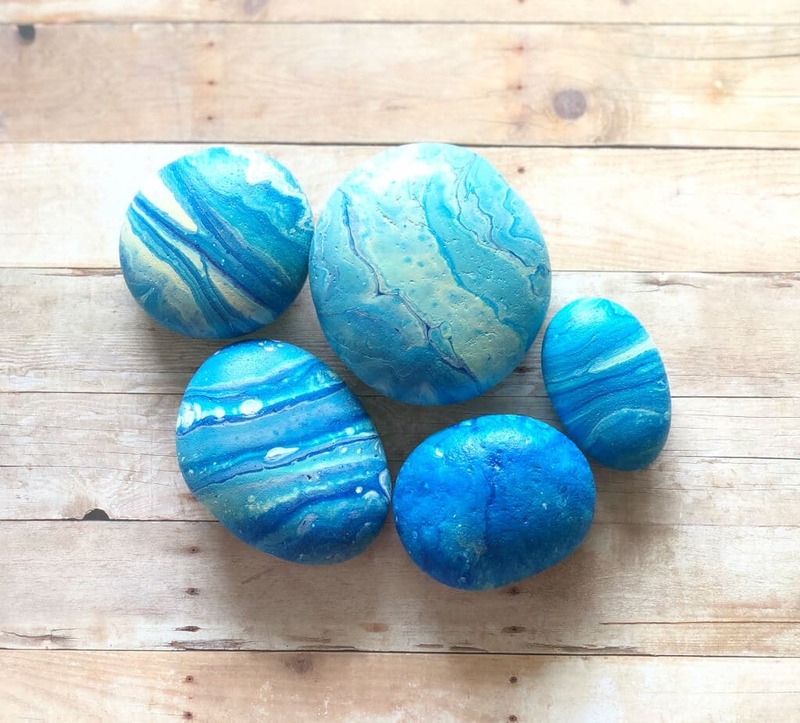 There are also times that I mix in Argon oil (like you would use to get the tangles out of your hair after washing) and it makes the color you’ve blended it into burst when spreading, adding some unique color blends and features to the finished rocks. 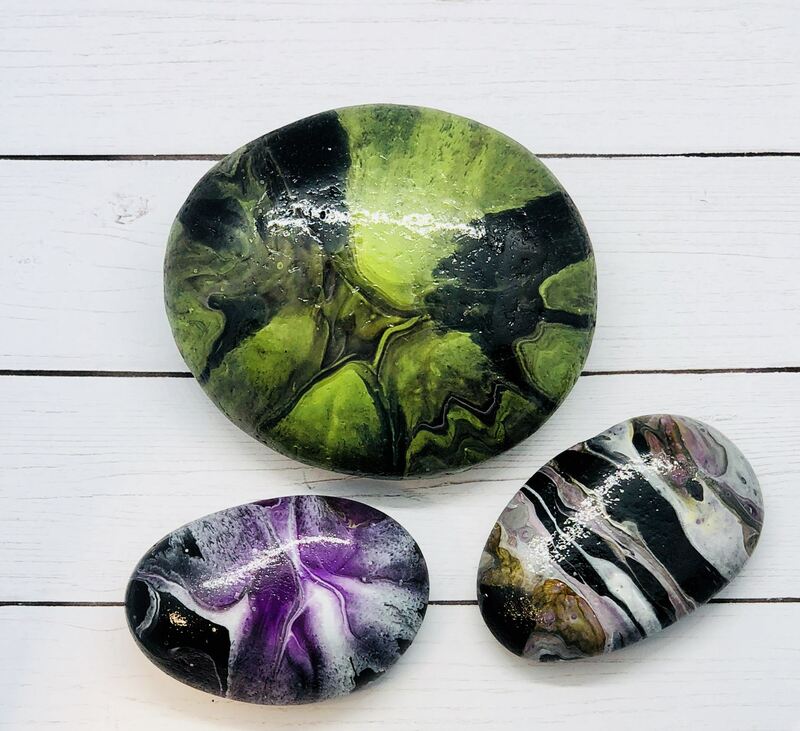 What are your favorite tools and supplies to use when creating these beautifully painted rocks? 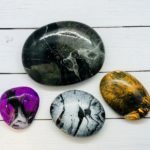 Heather: “I really like using the color shift paints on different rock pours, because they give such unique finishes when they’ve slightly blended during a pour. I started out using just some acrylic bottled paint that I’d used for painting t-shirts for my kids, and have expanded my collection to over a hundred paints. 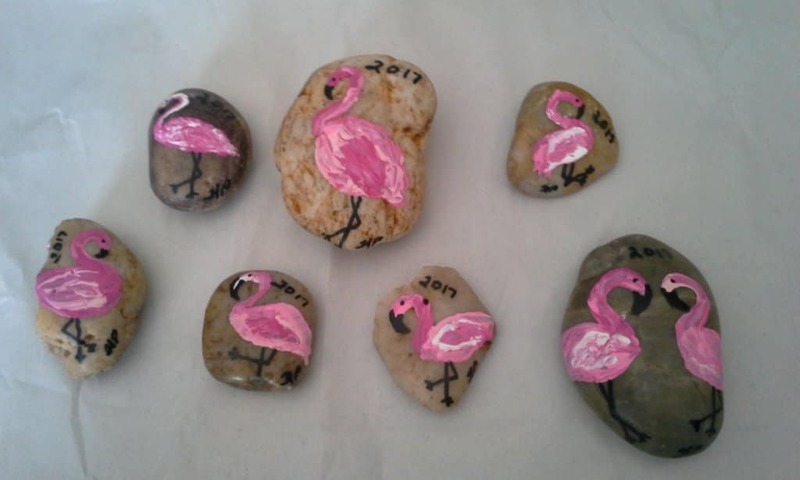 By having so many shades of similar colors, I can blend and shadow my flamingos so that they look more realistic. 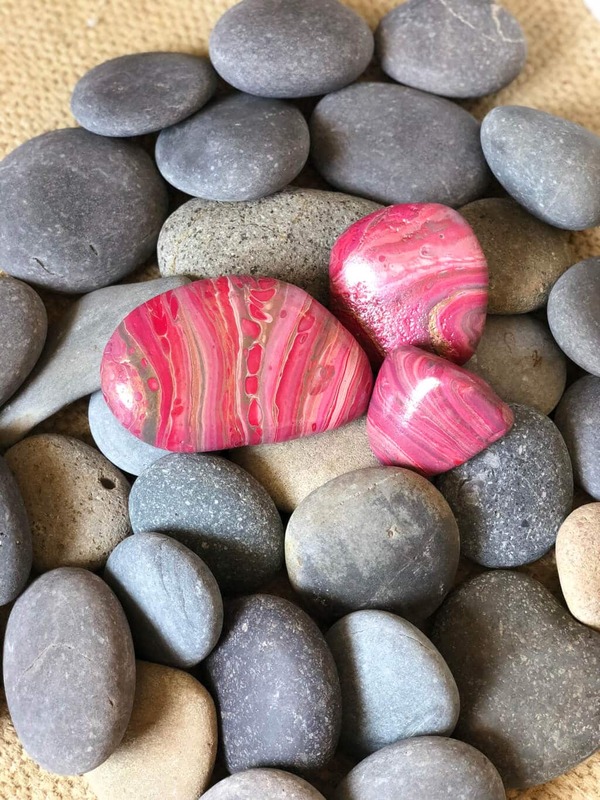 When I’m painting them, I’ll put two or three pinks together and dip my brush into the area that the colors meet, then when I brush it on the rock, it’s already blended. I don’t use the $1 special brushes; the bristles are too stiff… I do like a set of brushes that I got at Walmart with a selection of about 8 brushes. My favorite being one that has short maybe 1/4 ling bristles and the bristles are cut straight across instead of tapered. Sometimes I do put a basecoat on the rocks, so that the color I’m using will show up better, or going with a holiday theme, but most times, I just paint right onto the rock. 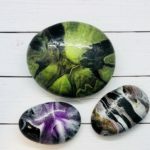 When I basecoat, I normally take the rocks outside and spray them with spray paint, rarely do I just spray them white, but I’ve found one Rustoleum that was a glitter green and fun to use for Christmas and St. Patrick’s Day rocks. Then paint shamrocks on top of that using gold or silver… simple but elegant… Or using white, and painting simple cancer ribbons on them for whichever friend has or has had a particular cancer. 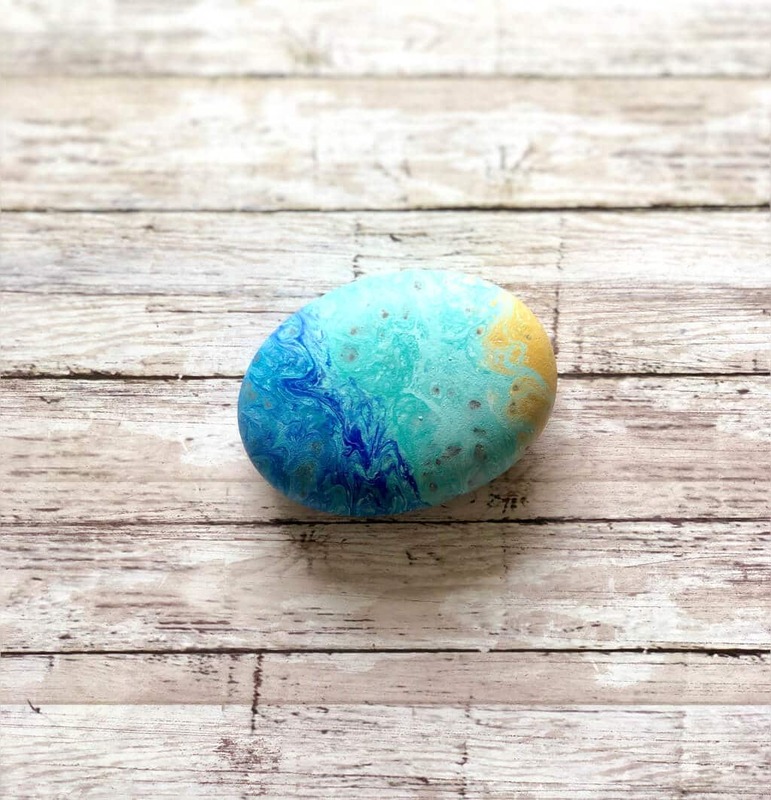 What advice would you give to my beginner rock painting readers? To learn more about Workman’s Friend Barrier Skin Cream, check out their website. 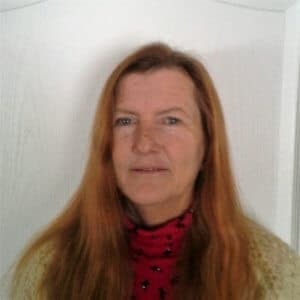 The following links are affiliate links, which means if you click on the link and make a purchase, I will receive a commission at no extra cost to you. What is a Paint Pour? Paint pouring or it’s also known as Fluid art is a form of abstract art that consists of pouring paint of many colors over a support creating beautiful art. Fluid art is great for beginners to explore abstract painting versus the pressure of traditional acrylic/oil painting of objects. There are actually many ways to accomplish fluid art. Some artist’s use open cylinder pours, direct pours, flip cup, upside down flip cup, ribbon pour, puddle pour, dirty pours, and so many more ways. Since I was using rocks as my support, I decided to use the dirty pour method. 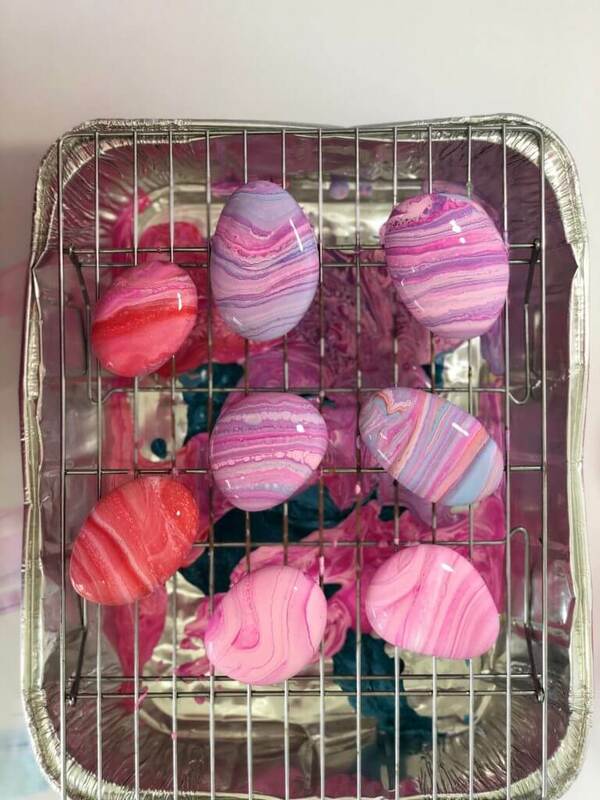 Basically, dirty pours consist of layering different colors of paint in a cup, then pour the paint over rocks. It’s simple and fun for all ages. Reusable containers for rock pouring, cheap foil pans with a lip works well. A base for rock. You can use anything from wide bottle caps to an upside-down egg carton, it just needs to be big enough to hold your rock above the surface area for paint runoff. You can also place a baking cooling rack inside a foil pan. 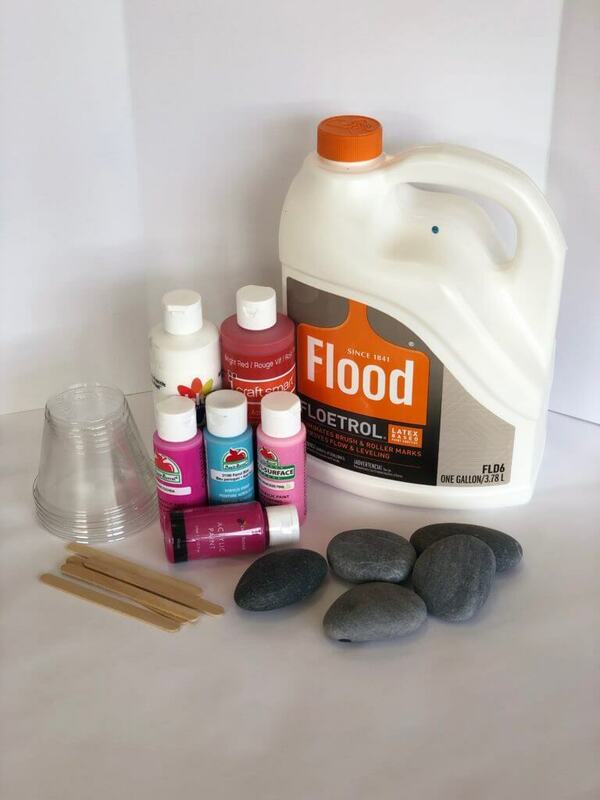 Keep reading below for quick DIY rock paint pour container. 1. Start preparing your paint cups. Choose the colors you want to work with and pour each color in its own cup. Mix in the pouring medium and stir with a craft stick. Mix just enough pouring medium to thin out the acrylic paint for pouring. The paint cannot be too thick, it needs to flow over the rock. 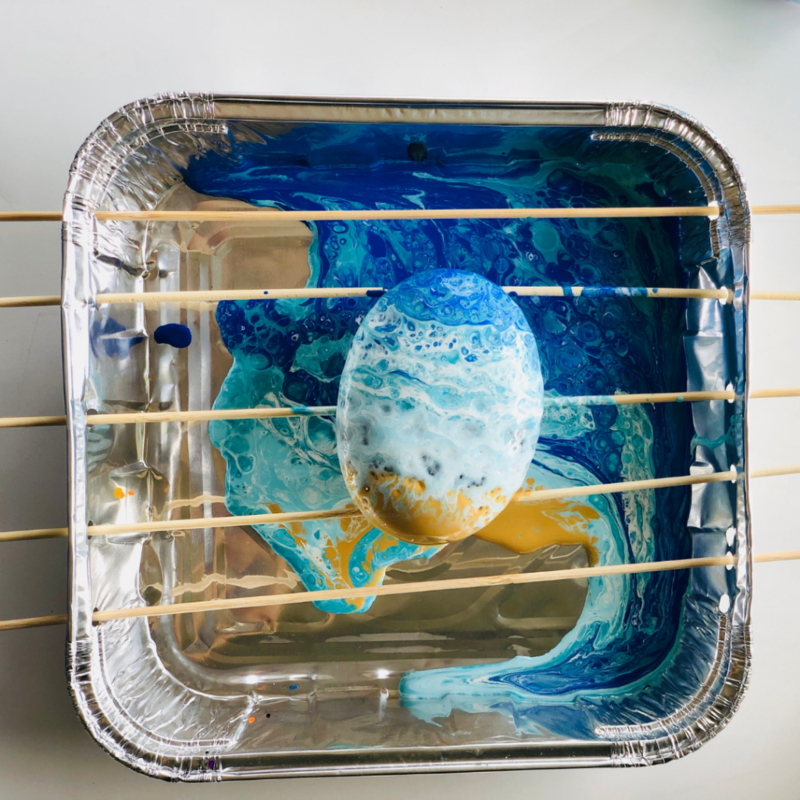 The paint should be able to coat the mixing stick but still be able to drip off smoothly. 2. Making the Dirty Pour. Use a larger cup and start pouring the paint into small amounts creating a layering effect with all the colors. 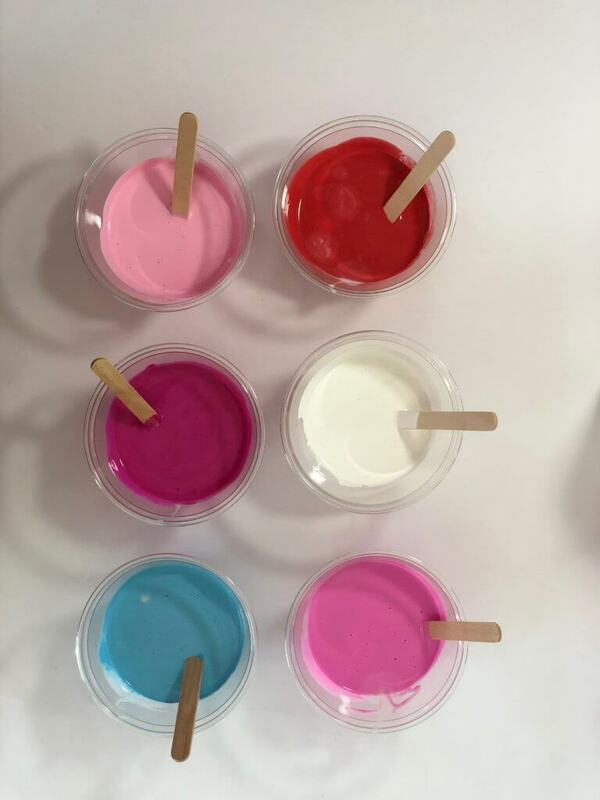 Once all the paint is emptied in the “pour” cup, the magic begins! 3. Begin pouring the Dirty Pour over the rock slowly in your desired pattern to cover the entire rock. 4. 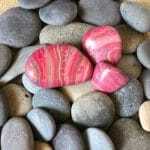 Let your rocks dry for at least 2 to 3 days before sealing. Super simple to make, all you need is a cake foil pan, bamboo skewers and a hole-puncher. Punch holes evenly parallel on both sides. Add more holes for strong base to provide support for heavier rocks. 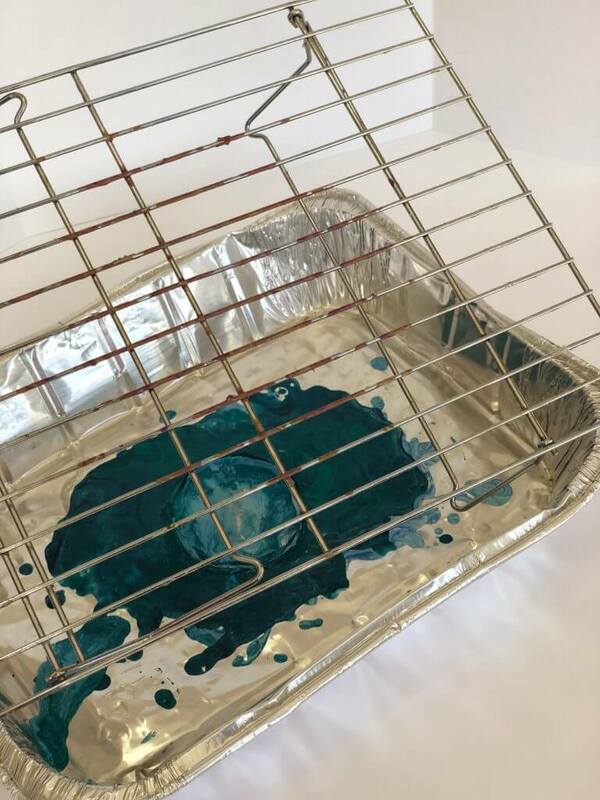 Feed the bamboo skewers through to make your own DIY paint pour pan. 35 Acrylic Painting Tips that will Blow your Mind! Visit our Art Toolbox Essentials page for a list of our favorite art supplies and tools! Show me your rocks! Join our Facebook Group and post your creations for all to see and inspire! If you like this, please share this on Pinterest and Facebook!